Before they were reusing bodies in Masters of the Universe Classics, Mattel was reusing bodies with their DCUC line. Since the majority of DC Superheroes wear form fitting body suits, it makes sense, and OMAC shares a good number of basic parts (torso, legs, arms) with many other characters. 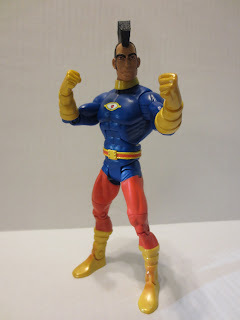 He comes in at just a little over 6 1/2 inches (although his Mohawk makes him taller) and is sculpted to fit in with the rest of the DCUC figures. While Jack Kirby's art was one of a kind, the Four Horsemen (the sculpting team on DCUC) have decided to skip artist specific styles for characters and instead have worked to ensure that all character's fit into the line in one harmonious style. Probably not a bad choice. Since he's built in the standard DCUC style, OMAC has the same joints as nearly every other figure: hinged ankles, hinged knees, swivel thighs, h hinged and swivel thighs, swivel waist, a hinged abdomen, ball jointed shoulders, swivel biceps, hinged elbows, swivel wrists, and a ball jointed head. Most of the articulation works fine and is pretty standard for Mattel's 6 inch DC figures. 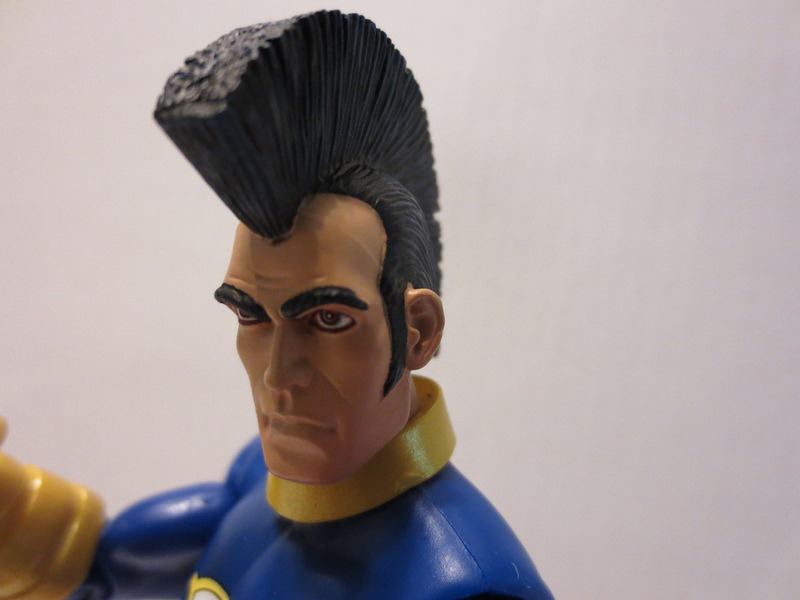 A few of my OMAC's joints were stuck, but after freeing them up they moved just fine. My only real complaint about the figure's articulation is that the ball jointed head has little motion to it except for the ability to swivel left and right. As I mentioned earlier, since a good portion of the figure is shared with multiple other DCUC figures, there are parts of this figure that most of you have seen at least a dozen times before. 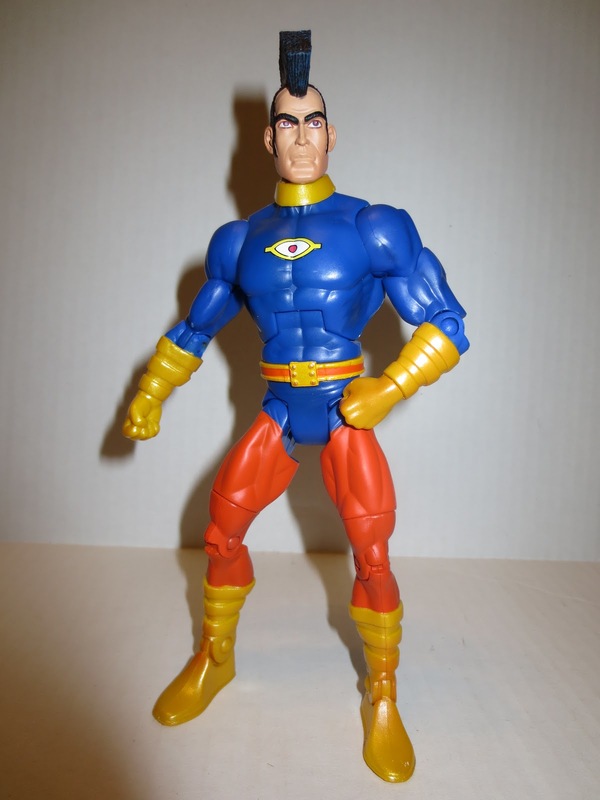 The standard body (thighs, crotch, torso, and upper arms) are all anatomically solid and convey the archetypal superhero build. The muscles are well defined and there's even some folds along the crotch to show the uniform bunching together. My only complaint about the standard body is that the knees always look so thin. OMAC does have some nice original parts, however, in the form of his belt, collar, gloves, and boots. The collar is a separate piece glued around his neck and the belt is a separate piece that fits between his lower torso and crotch. The belt looks like the belt from the comic in it's design, although I think the buckle could stand to be a bit larger. The gloves and boots all have their three distinct rings and there really isn't much to say about them other than that they match the source material. The head sculpt is quite good, as are most head sculpts done by the Four Horsemen. 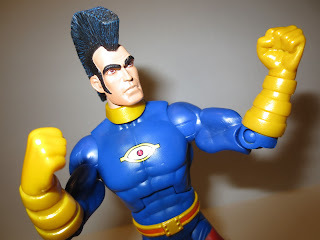 This isn't a straight up Kirby specific OMAC (the head's too thin and the feature are too rounded) but it certainly captures most of the elements of the character. The hair is spot on, too. He's got the sideburns, the slicked back hair on the sides, and that fantastic Mohawk. That piece of hair is large and in charge. The only baffling thing sculpt wise are OMAC's massively bushy eyebrows. They're ridiculously huge. They may be derived from some other interpretations of the character, but they don't fit this figure that's more Kirbyesque in design. 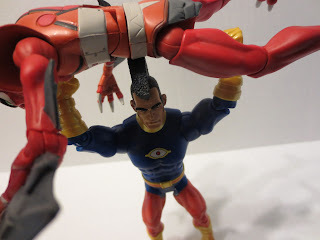 OMAC's a bright, bold fellow and the paint work matches. Actually, he's molded in many of the necessary colors, but any painted areas are typically neat and clean. The head is perfect- there's even a touch of blue in the hair to mimic the detailing used in older comics. The Brother Eye logo on his chest is a neatly applied tampo and the golden yellow used for his gloves, boots, collar, and belt buckle manage to have a nice shine to them. The only issue I have is that some of the orange plastic from OMAC's legs is showing through on his boots. It's not huge, but it is noticeable. 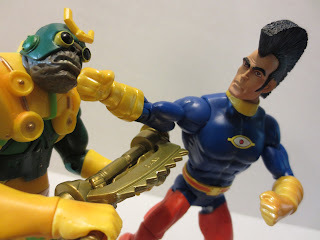 OMAC doesn't come with any traditional accessories, but he does come with a button and a piece of the series 15 "Collect & Connect" figure Validus. The button has a metal pin on the back and is emblazoned with the Brother Eye logo on the front. I actually like it quite a bit as it does relate to the character. If someone recognizes it on your satchel or backpack, you'll know you've found a true comic nerd. 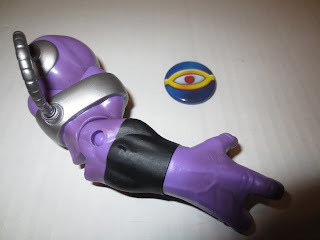 The Validus piece is the right arm. Validus seems like a cool figure, although I don't imagine I'll ever go out of my way to complete him. After the whole Gleek fiasco, I decided to stop being a DCUC completist. Now I just cherry pick the Batman related characters, Jack Kirby characters, and mystical characters. If anyone wants to help me snag a Metron or a Kamandi, you know where to find me. Overall, I think OMAC is definitely a figure that you'll either love or be bored with based on your feelings towards the character. If I were simply rating this as a figure, it'd get a good. It's a solid DCUC figure with no QC issues and solid paint and sculpting. 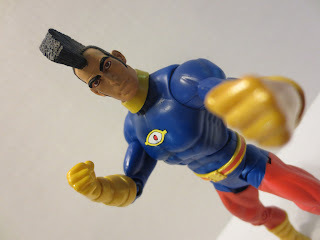 As a representation of OMAC, however, I'll Confirm him a Good and a 1/2. I'm not sure much more could have been done with this character and I think the Four Horsemen and Mattel did a nice job of bringing a fairly obscure character to life. He's not one of the best DCUC figures ever released, but he's certainly not one of the worst. Kirby had originally wanted to create a project with a new Captain America in the far future, but due to his issues with Marvel he held onto the idea until he was at DC. If you've never read OMAC, give it a try. It was a short series that ended too suddenly (only 8 issues) but it had some unique and interesting ideas. I haven't reviewed any other DCUC figures on here yet, but I have reviewed some of Mattel's Batman and DC Unlimited figures. I looked at Planet-X Batman, The Dark Knight Returns Batman, and the Injustice Batman. Sometimes, when bogged down with work, Barbecue17 calls himself OMRC: the One Man Reviewing Corps. Check out his army of work on his Flickr page.